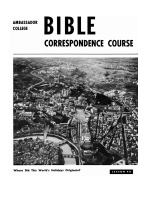 Lesson 40 - Where Did This World's Holidays Originate? Roman Catholicism is the "MOTHER" of this world's so-called "Christian holidays." Protestant churches — her "daughters" — remain linked to her in their doctrines and practices. Few realize, however, that Rome's holidays have roots dating back to the Tower of Babel! Vatican City and St. Peter's Basilica, pictured on our cover, are the new symbols to which the world is now looking. Rome's role in developing world unity — by encouraging religious unity under her banner — is emphasized by this startling air view. "IF BAAL BE GOD, FOLLOW HIM..."
VERY few professing Christians know why they observe the days they do. Why is it men all over the world observe so many different days of worship? So many foolish customs? It is time you asked and ANSWERED the questions, "Where did this world's holidays come from?" "Were they established by the SUPREME AUTHORITY of God Almighty?" "What Bible authority is there for the customs and traditions of the churches?" What about the holidays of modem Christianity? What about Easter — with its hot cross buns, bunnies and Easter eggs? And Hallowe'en — with its ghosts, witches and trick-or-treat? What about Christmas — with its red-nosed reindeer, Santa Claus and gift trading? Did these days come from the Bible? Why are professing Christians observing days which are NOWHERE commanded in your Bible? — days neither Jesus nor the apostles kept? Since Jesus Christ didn't keep them, how did they become dignified by the name "Christian"? Who conspired to have them replace the days God made holy? How did it happen? God created TIME! Man abuses it! When God created the heavens and the earth, the Almighty said, "Let there be lights in the firmament of the heaven to divide the day from the night; and let them be for signs, and for seasons, and for days, and years..." (Gen. 1:14). The earth's rotation regulates the length of a day. The lunar phases indicate the length of a month. And the orbit of the earth around the sun dictates the length of a year! By calculating the relationships between these celestial bodies — by God's Own "master-clock" of the universe — man measures time! Since Almighty God CREATED time, HE ALONE has the authority to set aside certain days for worship — to make them HOLY! Did you know that the Creator God put within man the desire to observe days? The observance of days for worship is a basic drive of human nature. That is why every tribe, every nation, every religion singles out certain times of worship. But without God's own instruction, man can't know which days God Himself MADE HOLY! God has not left His worship to human whim — dependent upon HUMAN IDEAS, HUMAN TRADITIONS! Man has no authority to establish days of worship — HOLIDAYS of human manufacture! God Almighty, in His Word, CONDEMNS humanly devised worship as vain! Jesus said, "In vain do they worship me, teaching for doctrines the commandments of men." (Mat. 15:9.) It is possible to actually WORSHIP GOD — to venerate the NAME of Christ — and still do it ALL IN VAIN! Jesus said so! God's Sabbath Day — so Satan has instituted his holidays. They are counterfeits — as counterfeit as the Devil himself! They were contrived to hide God's Supreme Master Plan. Pagan holidays are made to appear happy times, times to enjoy yourself. But they are really only "pain killers" designed to cover up the EMPTY RITUALISM of today's counterfeit Christianity. No one in the world, it seems, questions Satan's Days — they have become CUSTOMARY — TRADITIONAL! They are assumed to be "Christian." But YOU CAN'T AFFORD TO ASSUME! It is time to UNMASK Satan's pagan holidays for what they are — a diabolical scheme to plunge a deceived mankind down the broad way to ETERNAL DEATH! The Devil would like you to believe you can flout God's commands, trample His Holy Days underfoot, and worship in whatever way you choose. Satan's ministers object to keeping God's Holy Days. They purr: "It makes no difference which days you observe; all days are holy to God. Worship on whatever days seem right to you." These lying ministers are the direct tools of Satan the Devil! Make no mistake — God says you must choose whom you will serve! "If the Lord be God, serve Him. But if Baal, then follow him." If the Devil be God, then keep his Easter, Xmas, Hallowe'en. But if the Eternal Creator is the Living God, then you had better keep holy the days He made holy! It does make a difference! It is a matter of your eternal life or eternal death. Satan's pagan holidays have been so cleverly devised that many, though acknowledging their PAGAN ORIGIN, still stubbornly refuse to stop observing them! Don't YOU be among them. In this lesson you will learn HOW the Devil plotted a counterfeit "Christianity." You will see the rank paganism of the ancient world treacherously re-labeled — "baptized" — with Christian-sounding names! It has all been done in the name of Christ — purporting to be the worship of Jesus! You will learn that the very same pagan practices God condemned in Old Testament times have been insinuated into modern "Christianity" and are being celebrated today. You will learn who it is that has been perpetuating the GREAT FALSE SYSTEM behind today's religious customs — and WHY! You will learn which GREAT FALSE CHURCH is responsible for planting these pagan days in the matrix of modern Christianity. Let's begin to understand the TRUTH about Satan's pagan holidays....!! "Why," some will ask, "didn't God warn us in the Bible that pagan holidays would be substituted for His Holy Days?" The answer is HE DI D WARN us! 1. Did Jesus Christ warn Christians in the end times that false ministers would deceive the many? Mat. 24:11. Would these seem to be "Christian" ministers who preach about Jesus Christ, but still deceive many? Verses 4-5. 2. Can one worship Christ, call himself "Christian," and still do it all in vain? Mat. 15:9. How? — by worshipping according to the dictates and traditions of men? Same verse. to be Christian — even pretending to be apostles? II Cor. 11:13-14. 4. Did the apostle John write that among the Church of God at Ephesus some of these false ministers — falsely calling themselves Christ's Apostles — had been discovered? Rev. 2:2. How were the false apostles of Ephesus discovered — by their fruits? Verse 6. 5. Does God say He hates the deeds of the Nicolaitanes? Same verse. Did the Nicolaitanes have specific false doctrines? Rev. 2:15. 6. Who were the Nicolaitanes? See comment. COMMENT: A Nicolaitane is a follower of Nicolas! The name Nicolas is derived from the Greek words, nikos and laos. Nikos means the "conqueror" or "destroyer," and laos means "people." The original Nicolas was a conqueror or destroyer of the people! Nicolas was merely the Greek word for Nimrod — the original arch-rebel who conquered the people and founded man-made religion within two centuries after the Flood (Gen. 10:8)! While Nimrod was alive he put himself in the place of God by his dictatorial rule. And when he died, his admirers CONTINUED TO WORSHIP HIM AS A DIVINE HERO. They CALLED HIM "BAAL," a name found later throughout the Old Testament. "Baal" means "master" or "lord." It was only natural that Nimrod should claim that name. He put himself in the very place of the true Lord or Master of all the entire universe. But "Baal" was not Nimrod's only other NAME! HE HAD MANY NAMES. In Babylonia he was known as "Tammuz." In Syria and Greece, "Adonis" — which also meant "lord." In Egypt he was the god Osiris, and was identified in "mystery" symbolism as the bull! All these names were a direct attempt to disguise his true identity! Now you might ask, "Is there any connection between Nimrod, who was called 'Santa' in Asia Minor, and 'Saint' Nicolas of Asia Minor — 'Santa Claus'?" "SANTA CLAUS" is but a shortened form of "Santa Nicholas" or "Saint Nicholas." The followers of "St. Nicholas" or Nimrod are termed "NICOLAITANES" IN THE NEW TESTAMENT! So those people — who falsely called themselves "Christians" — continued to honor Nimrod in the days of the apostle John! — just as they do today! You may not have received your free copy of the booklet, "The PLAIN TRUTH About Christmas" — write for it immediately and study it carefully! You will see how Satan has deceived men into worshipping Nimrod — all the while calling him the Saviour! 7. What was the doctrine of the Nicolaitanes originally taught by Nimrod? Gen. 10:8-10. COMMENT: Nimrod was opposed to God. The phrase "a mighty hunter before the Lord" in the Hebrew indicates he had set himself in opposition to — and in the place of the Lord. Nimrod was the world's first despot. Josephus, prominent Jewish historian, says of him, "Now it was Nimrod who excited them to such an affront and contempt of God... he also gradually changed the government into tyranny...." (Ant. Bk. l, Chap. IV, Part 2). 8. What more did Nimrod do in rebellion against God? Gen. 11:1-9, compared with Gen. 10:10. Wasn't Nimrod's first city Babel, or Babylon? Same verses. COMMENT: Again, notice the testimony of Josephus: "He [Nimrod] also said he would be revenged on God, if He should have a mind to drown the world again; for he would build a tower too high for the waters to be able to reach!" Nimrod claimed to be the "saviour" of mankind — saving them from God! Such was his blasphemy! The people he had conquered now followed him. "Now the multitude were very ready to follow the determination of Nimrod," reports Josephus, "and to esteem it a piece of cowardice to submit to God!" Nimrod taught that it was wrong — cowardice — to submit to God and His laws! This was the doctrine of the Nicolaitanes! 9. Doesn't God label this false religious system by the name of its city of origin? Rev. 17:5. Her very name bears God's indictment of her sins! Has this system been perpetuated down to our day today? Review Rev. 18:1-8. Since the time of Babel — and continuing into our modern twentieth century — the false religion of Nimrod has dominated the world! Today his religion bears Christian names, but it is still pagan in practice and in purpose. After God scattered the nations at Babel (Gen. 11:8) and especially after the death of Nimrod, his followers continued their rebellion in secret. They developed an intricate symbolism called the "mysteries." This pagan system hinged on the careful re-naming of all phases of their worship: In order to deceive the people, the priests of Nimrod began calling their wicked customs by names which seemed to honor God Himself! Nimrod took the name "Lord," which translated into Hebrew became "Baal" and into Greek became "Adonis." Nimrod's wicked mother, known to historians as Semiramis, took the name of the "Mother of God," and was worshipped as Ishtar — the mother goddess of dawn or light (Lempriere's Classical Dictionary, article, "Adonis"). Her new name, "Ishtar," was pronounced just as we pronounce the word "Easter" in English! She was worshipped in the spring — her feast day a rite of fertility! You will want to read all about the origin of Easter in our free booklet, "Easter Is Pagan" — write for it immediately! Notice how widespread the worship of Nimrod and Semiramis had become in the time of Moses — and what God says about it! 1. Did God warn His people to avoid the ways of Egypt — a land rife with pagan customs and traditions? Lev. 18:3, first part. Did He also warn them not to adopt the customs of Canaan while they were in the wilderness? Same verses. 2. Why was God against the practices of the heathen? Had they defiled the very land they lived in? Lev. 18:26-30. 3. Did God punish the heathen who defiled themselves by practicing pagan customs? Did He cast them from the land so that Israel could inhabit it? Verse 28, see also Lev. 20:23. COMMENT: God is no respecter of persons. Whichever people practice pagan customs and defile themselves on pagan holidays He punishes! Notice what He told Israel in Deut. 8:19-20! penalty for sin still the same today? Rom. 6:23. COMMENT: God says "I change NOT!" (Mal. 3:6.) He still exacts the death penalty — the second death — for observing pagan customs. In Old Testament Israel the civil government of the nation executed sinners. Today God Himself places the guilty person under the spiritual penalty of eternal death! Many today assume that because they have always worshipped on pagan days and are still alive, they have somehow escaped the death penalty! But Jesus Christ is about to return with the sharp two-edged sword of God's Word to condemn and execute those who assume they can flout God's law and not pay with their lives! 5. Were God's people instructed, instead, to keep the Holy Days God revealed to them? Lev. 18:4-5. Do God's Holy Days lead to life? Verse 5 last part, notice the word "statutes." COMMENT: Among the statutes God has given for His people are His Holy Days — days which reveal the way to salvation and eternal life to those who KEEP THEM (Lev. 23:14, 21, 31, and 41). 1. Does God promise to bless His people abundantly if they will keep His Holy Days? Read. Lev. 26:1-13, especially verses 2 and 3. But if Israel broke the covenant by sinning, would they suffer punishments? Read Lev. 26:14-39. 2. Was it within the heart of Israel to always obey God? Deut. 5:29. What does Jeremiah remind us about the human heart? Jer. 17:9. "lo Saturnalia!" — "Merry Christmas!" Christmas customs — illustrated on page 9 — were celebrated in Rome long before the birth of Jesus Christ! They were called the "Saturnalia." Toward the end of December the Romans set aside several days to celebrate the winter solstice — when the sun reached the lowest point in the heavens, and the days were shortest. The high point of this solar festival was the Saturnalia. The offering was made beneath a decorated tree — Virgil, the pagan poet, mentions a pine or evergreen. Figurines and masks — called "oscilla" — were hung on the tree, as are Christmas decorations today. History admits "... there can be no doubt that we have in these 'oscilla' a relic of human sacrifice...!" Of all the pagan holidays, Saturnalia was the one at which human sacrifice was especially required. Imperial Rome adopted the name of Christ and applied it to existing pagan customs. Today families decorate their "Christmas" trees with masks and figurines — unwittingly perpetuating a custom of Roman human sacrifice. The practice of commemorating the winter solstice is not limited to ancient Rome! Nearly every pagan nation has observed a counterpart to modem "Christmas" customs! Why haven't you been told before that this world's "Christianity" is none other than ancient Baalism masquerading as the religion of Jesus Christ? 3. When Israel came into the land of Moab, what did they do? Num. 25:1-3. What did God instruct Moses to do with those who polluted themselves by worshipping Baal-Peor, the god of the Moabites? Verses 4-5. Who was this Baal-Peor? See comment. COMMENT: Baal-Peor was another name for Nimrod. The compound name Baal-Peor had special significance to the Moabites who worshipped Nimrod as a child. Today, in mid-winter, the "sacred child" is still worshipped! The familiar mother and child theme at Christmas is a cleverly disguised pagan "mystery" which dates back to Nimrod and his mother Semiramis! The "New Year's baby," once worshipped in ancient Greece as Dionysus or Adonis — "the lord" — is now welcomed in the churches of modern Christianity! No wonder God Almighty was enraged when Israel began to observe the wild, licentious rites of Baal among the Moabites! For historical proof of the origin and perpetuation of this pagan worship, write for the free article, "The Truth About New Year's." 4. When God's people approached the promised land, did He remind them of His warning against adopting pagan holidays? Deut. 12:29, 30, 31. 5. Was Israel warned specifically against transferring pagan customs to the worship of the true God? Verses 30-31. Did God warn them not to add any pagan rites to His commands? Verse 32. Why did God hate the hideous rites of these pagan religions? Verse 31, last part. 1. After Joshua died, did Israel adopt the religious customs of Canaan? Judges 2:8-13. 2. Who were the principal pagan gods worshipped by rebellious Israelites? Chapter 2:13. COMMENT: Baal-Nimrod — and his wicked mother Semiramis were both worshipped! Ashtaroth was another name for Semiramis. In Greece she was called Venus and Astarte. 3. Did God bring punishment upon those who corrupted themselves in pagan worship as He had warned? Verses 14-15. 4. When they were punished did they repent of their idolatry? Verses 16-19. COMMENT: The book of Judges is a chronicle of the repeated rebellions of ancient Israel when they entered the land of Canaan. Each time they forgot God's law — lost sight of His Holy Days and His plan — they began to worship heathen gods on pagan holidays. When they did, God chastened them by allowing them to be conquered by the Canaanites. After the reign of Saul, God established the dynasty of David — a man after His own heart (Acts 13:22). But soon after David was dead, his son Solomon forsook God's law, and introduced pagan religions into Israel! Notice the events that led up to the division of his kingdom! 1. After the temple was finished, did God renew His covenant with Solomon? I Kings 9:1-9. Were the conditions of the covenant the same as before — had God changed? Verses 4-5. Did God warn Solomon not to worship other gods — not to pollute the land with paganism? Verses 6-7. 2. What punishment did God promise to send if Solomon adopted pagan ways? Verses 8-9. 5. Did he also worship Nimrod — the first despot? Verses 5 and 7. COMMENT: Nimrod was called Milcom and Molech by the Ammonites, and Chemosh by the Moabites. The word "molech" is derived from the Hebrew word "melek," which meant "king." The heathen nations worshipped Nimrod as the "king of kings" because he was the world's first tyrant! Ashtaroth or Semiramis was worshipped as the "queen of heaven" by the ancient pagan world. Today a "queen of heaven" and "mother of God" is worshipped by modern Christianity. Some assume she is Jesus Christ's own mother Mary, who supposedly has ascended bodily into heaven. Prayers are repeated to her! But Christ's mother is yet in her grave awaiting the resurrection! How clever Satan's deceptions are — don't you be deceived! 4. How did God look upon Solomon's idolatry? Verses 6, 9-10. Did God warn Solomon that punishment for his sins would surely come? Verse 11. Who would reign in Solomon's place? Verses 12-13. Read also verses 26-40. 5. Was Jeroboam also offered God's blessing for his obedience, and warned not to copy the customs of paganism? Verse 38. How many of the tribes of Israel would Jeroboam rule? Verse 35. 6. When Solomon died and Rehoboam his son took the throne in Judah, did God take 10 tribes of Israel from him and give them to Jeroboam, the servant, as He had promised? Read the entire 12th chapter of I Kings. COMMENT: The nation of Israel was divided for adopting pagan worship! Adopting the customs of the heathen makes a difference indeed! Jeroboam ruled the northern 10 tribes — known as the House of Israel, and Rehoboam ruled only the remaining tribes of Judah, most of Levi, and Benjamin — called the House of Judah. Now that the 10 tribes of Israel had separated from Judah, they began to develop their own unique form of paganism. It was a syncretism or blending of God's worship with the poison of pagan error. One of the principal holidays they instituted was Hallowe'en. Notice it in your Bible (I Kings 12:25-33). 1. Did Jeroboam think that in order to maintain control of the 10 tribes of Israel he must stop their worship on God's Holy Days? I Kings 12:26-27. Did he tell them it was too much trouble to go all the way to where God had placed his name, just to keep the Holy Days? Verse 28. 2. What one of God's Holy Days did Jeroboam counterfeit and corrupt with pagan customs? Verses 32-33. COMMENT: The Feast of Tabernacles and the Last Great Day were held in the seventh month (Lev. 23:33-39). That corresponds to about the middle of September and October. 3. Did God warn His people not to make the excuse that the way to His feast was too far? Deut. 14:24. 4. When was Jeroboam's idolatrous feast held? I Kings 12:32. This eighth month corresponds to about the middle of October and November. COMMENT: The pagan Roman calendar man has adopted for use in this modem world has been corrupted — but the feast of the eighth month is still being kept today! The Latin word for eighth was "octo." The eighth month was called October! Today Jeroboam's pagan holiday is carried on under the name of Hallowe'en celebrated at the very end of October and the beginning of November. It pictures a macabre scene of disinterment of the dead as ghosts and goblins. Hallowe'en is a counterfeit of God's festivals which reveal, not goblins, but the resurrections of the righteous dead and of those who will learn God's ways after the millennium. Once again Satan has counterfeited God's truth, and hidden God's Holy Day plan from mankind. You will want to learn all about the customs of Hallowe'en from the free article, "Hallowe'en, Where Did It Come From?" — send for your copy now! After the division of the kingdom, the northern 10-tribe House of Israel went deeper and deeper into Baal worship. In the time of Ahab, the Eternal sent Elijah to reprove His people. Read of the choice Israel had to make, beginning in I Kings 16:28-33. 1. How did Ahab introduce Baal worship into the capital city of Israel — Samaria? I Kings 16:31-33. Did Ahab follow the ways of Jeroboam? Verse 31. What was God's reaction to Ahab's sin? Verse 33. 2. Did God send Elijah to warn Ahab? I Kings 18:1-2. 3. Did Jezebel, Ahab's wife, murder God's ministers in Israel? Verse 4. 4. What did Elijah tell Ahab? Verses 17-18. Did Elijah challenge Ahab and his false ministers to a test? Verse 19. 5. What did Elijah say when the people gathered to witness the test of Baal at Mount Carmel? Verses 21-24. Were the people of Israel wholeheartedly following God — or Baal-Nimrod? Verse 21. COMMENT: The people thought they could do nothing — just sit on the sidelines and watch the contest between Elijah and the prophets of Baal. They had probably convinced themselves it didn't make any difference which customs they observed. But by not choosing to follow God, they were rebelling against Him. 6. In the contest which followed, how did the prophets of Baal call upon their false god? Verses 25-29. Did they whip themselves up into an emotional frenzy? Verse 26. Did they torture themselves with cruel penance, assuming they could force Baal to hear them? Verse 28. But could Baal answer them? Verses 27 and 29. 7. While the priests of Baal were involved in their superstitious rigamarole of pagan religion, what did Elijah do? Verse 27. COMMENT: Elijah taunted them by asking why Baal didn't answer. Was Baal out walking? Was he away from Carmel on a trip? Perhaps, insinuated Elijah sarcastically, Baal was sleeping! people will know the difference and choose the good. 8. When did Elijah begin to pray? Was it according to the instructions God had given for worship? I Kings 18:30-37, especially verse 36. COMMENT: The sacrifices were added a year after God gave the spiritual laws of the Ten Commandments and instituted His Holy Days. Sacrifices were never a part of the spiritual law concerning the Holy Days. So, when the sacrifices were fulfilled in Jesus Christ and became unnecessary, no change was made in the command to keep God's Holy Days (Jer. 7:22-23). 9. When Elijah prayed did God answer? I Kings 18:36-38. Were the people convinced? Verse 39. What then did they do with the false ministers of Baal. Verse 40. 10. But did Ahab and Jezebel repent? I Kings 19:1-2. What did God say of Ahab? I Kings 21:25-26. 11. Did Ahab's son, Ahaziah, continue to worship Baal when he took the throne? I Kings 22:51-53. Did he follow the sins of Jeroboam? Verse 52. Israel's idolatry continued for many years. Each succeeding king perpetuated pagan holidays for the people to keep in honor of pagan gods. Finally Israel's sins cut them off from God's protection, and they were carried away captive into Assyria. Read the reasons why, beginning in II Kings 17:6. 1. Did Israel begin to sin against God? Verse 7. Did their idolatry increase even after the time of Jeroboam? Verse 8, note the word "kings" is plural. 2. Did Israel worship paganism openly — or did they try to keep it secret? Verse 9. Did they carry on customs like the heathen? Verses 10-12. 3. Did God diligently send His ministers to show the people their sins, and plead with them to repent and keep His commandments and Holy Day statutes? Verse 13. But did Israel repent? Verses 14-17. 4. Which tribe was left in the land? — the House of Judah only? Verse 18. But was Judah faithful or did they also follow the pagan ways Israel had introduced? Verse 19. 5. Some of Judah's kings uprooted the worship of Baal-Nimrod — and restored God's law. Among them was Josiah. Had Josiah been prophesied by name to restore the Holy Days of God, and abolish the pagan holidays of the people? I Kings 13:2-3. Compare II Kings 22:1-2. 6. What did Josiah do? Read thoroughly the 23rd chapter of II Kings. Compare it with II Chron., chapter 34. COMMENT: When the pagan holidays Israel and Judah had observed were done away, Josiah re-instituted the keeping of God's Holy Days, according to the law. 1. Even though Josiah sought to reform the people, was he able to stamp out their pagan rites completely? II Chron. 34:33 Did God send Jeremiah in the days of Josiah to prophesy the fall of Judah? Jer. 1:1-3. 2. What did God say through Jeremiah about the pagan religion of the cities of Judah? Jer. 1:15-16. 3. Did He say they still offered incense to Baal? Jer. 7:9-10. What was the excuse the people offered for their paganism? Verse 10. COMMENT: The people thought they were "delivered" or permitted to worship in whatever way they pleased — "under grace"! 4. Did the people of Judah worship the "queen of heaven" — Semiramis? Jer. 7:17-18. COMMENT: Even today modern Christianity has adopted the worship of Easter and bakes little "cakes" for the false "queen of heaven," calling them "hot cross buns." The fertility symbols of this ancient pagan goddess are perpetuated today as lies told to modern children. Rabbits, known as a symbol of reproduction in all pagan religions, are said to "deliver" Easter eggs to modem boys and girls. These customs come directly from ancient paganism — the worship of Nimrod and his mother — to our world today. Now they are encouraged by professing "Christian" churches! 5. Judah looked upon this pagan feast as a happy occasion when the whole family could participate in a pagan rite — didn't they? Verse 18. But what did God say about it? Verses 19-20. 6. Did God warn His people through Jeremiah not to adopt the customs of the heathen? Jer. 10:1-2. Does God condone the custom — again perpetuated into our modem world — of preparing "Christmas trees"? Verses 3-4. What does He say concerning the false ministers who teach these pagan customs? Verse 21. 7. Isaiah also was sent to Judah. What did God think of Israel's pagan feasts and pagan sacrifices? Isa. 1:13-14. Would God hear their prayers while they were worshipping on days of their own invention? Verse 15. What did He command them? Verses 16-17. COMMENT: God refers to the pagan feasts the people invented as "your appointed feasts." In contrast He calls the Holy Days He commanded, "My Holy Days" (Isa. 58:13, Lev. 23:2). 8. Notice what Hosea says concerning Israel's feasts of Baal. Did Israel use the bountiful crops God had given her for the worship of Baal? Hos. 2:8. Did God say He would stop the revelry of Israel's pagan feast days? Verse 11. Which days were these, God's Holy Days, or the counterfeit feast days of Nimrod? Verse 13. COMMENT: The Revised Standard Version translates the beginning of verse 13, "And I will punish her for the feast days of the Baals...."
9. Is the prophecy of Hosea dual? Does it apply to our day, today? Verses 16-23. Has this been fulfilled as yet? Verses 17 and 18. COMMENT: Note verses 16-18, the names of Baal — of Nimrod — have not yet been taken away. The prophecy of Hosea is dual — it will be completed in our day! instead — that it is not necessary to keep God's law today? Verse 8. 12. Did Daniel prophesy of a power that would speak against God — persecute His faithful servants — and attempt to change times and laws? Dan. 7:25. Would these pagan holidays continue right up until the time of God's Kingdom. Verses 26-27. 1. Did Jesus Christ speak of false ministers deceiving many in the time of the end? Mat. 24:11. At the very end, would some even claim to be the Saviour of mankind — calling themselves Christ? Verse 24. Would they be able to perform signs and wonders? Same verse. 2. Would these false ministers outwardly appear in the guise of "Christianity," but all the while actually be wolves seeking to devour God's people? Mat. 7:15. 3. Did Jesus say some would call Him "Lord," yet refuse to obey Him? Verse 21. Do some actually preach, perform signs and wonders in His name, yet work iniquity? Verses 22-23. COMMENT: The word iniquity means "lawlessness." This doctrine of lawlessness is the same as that which Nimrod preached, that it is cowardice to obey God. 4. Did God warn His people not to pollute His name by applying it to pagan worship? Ezek. 20:39. 5. Who is it that has perpetuated the lies of paganism — calling them by the name, "Christianity?" Jer. 14:14. Has it been false ministers who have substituted God's name for Baal and Baal's for God? Jer. 23:25-27. "Baal" simply means "the lord." Does God promise these lying ministers will be rewarded with captivity, famine and death? Jer. 14:15. 1. Did the Apostle Paul constantly have to battle the inroads of false teachers who sought to unsettle the Church of God? What was he forced to say to the Thessalonians? II Thess. 2:1-2. Were some sending epistles — letters — that were forged with Paul's own name? Verse 2. 2. Was a mystery system of lawlessness already at work in the time of Paul? Verse 7. Would this same system continue down to the coming of Christ? Verse 8. By whose power did this mystery system work? Verse 9. 3. Did Paul warn the Galatians about false ministers preaching a false gospel? Gal. 1:6-9. Were the Galatians in danger of slipping back into the pagan rites they had observed as unconverted Gentiles? Gal. 4:8-11. COMMENT: Paul was writing to Gentiles who wanted to return to observing "days" — Gentile days — Easter, Christmas, Sunday. Also certain years were set aside quadrennially and biennially during which were national idolatrous feasts and the celebration of the Olympic and Pythian games. 4. Did Paul call these pagan feasts the "weak and beggarly elements" they had served when they did not even know about God's Holy Days? Verse 9-10. 5. Did the same problem with false ministers develop among the Church of God in Colossae? Col. 2:4, 8. Were these false ministers teaching the ways — the rudiments and traditions — of the world? Verse 8. Were they teaching the worship of angels? Verse 18. Did they advocate ordinances of asceticism? Verses 20-21. 6. Aren't all these false teachings to perish since they are only the commandments of men? Verse 22. 7. Were the false ministers of Colossae criticizing God's people for keeping His Holy Days? Verse 16. But didn't Paul say no man should judge true Christians for anything they did on God's Holy Days, including His special new moon — the Feast of Trumpets, or His weekly Sabbath day? Same verse. COMMENT: Colossians 2:14-16 is a clear proof that Christians today should keep God's Holy Days regardless of what men might say. If you want to learn more about this controversial passage write for our free article, "Does It Matter Which Days You Observe?" 1. Who then, is responsible for accepting the rites and practices, the customs and traditions, the pagan holidays and festivals of Nimrod into modern Christianity? Were pagan customs being insinuated into the true church in the time of Jude? Jude 4. 2. Had some in Pergamos accepted the doctrine of the Nicolaitanes? Rev. 2:15. Were the false ministers of Satan organized into a church or synagogue? Verse 9. Did some of Pergamos adopt the doctrine of Balaam? Verse 14. COMMENT: The doctrine of Balaam was a doctrine of compromise with paganism. Read about it in Num. 25. Notice there how the Israelites compromised by attending the worship service of the Midianites who worshipped Baal-Peor. 3. Did Christians of Thyatira follow this theme of compromise and allow a woman whose character was like that of Jezebel to commit sin in their midst? Rev. 2:20. 4. Who is this modern Jezebel? Isn't the great false church pictured as a woman? Rev. 17:1-2, 5. Didn't Jezebel have children — more than one? Rev. 2:23. Compare Isa. 47:8-9 with Rev. 18:7-8. These are daughter churches who came out of Rome protesting but still have the character of their mother! 5. Was it not the Roman Catholic Church which compromised with the paganism of the old world and adopted it as "Christian?" See Comment. COMMENT: Notice the testimony of Walter Johnson, British archeologist: "... by the edict of Theodosius (A.D. 392), pagan shrines were to be dedicated as Christian churches. Later, the edict of Honorius (A.D. 408) definitely forbad the demolition of heathen temples...." Johnson continues, "Again, pagan festivals were converted into Christian holy days [holidays]. The yuletide merrymakings in honor of Thor — revels which have also been connected by some writers equally with the god Adonis, Dionysus, and Mithra — became the festival celebration of the birth of Christ. Thus, by the retention of holy oaks, of idolatrous feasts, of pagan symbols and ceremonies, of the heathen names for the days of the week, the new religion gained entrance." Johnson concludes: "Christian and pagan ideas were blended. Following... the only practical method — that of peaceful permeation the church often retained the forms of heathen ceremonies, while actually investing these with new meanings." 6. Were these adopted pagan holidays and ceremonies passed on to the "protesting" daughters of Roman Catholicism — the Protestant Churches? See Comment. COMMENT: Webster, in Rest Days, p. 306 writes, "... the feast of All Souls in November is a continuation of an old heathen feast of the dead; and that the Nativity of Christ himself was assigned to the winter solstice in December because that day was deemed the Nativity of the Sun.... Many of the holy days in the religious calendar of Christendom were borrowed, as is well known, from the festivals of ancient paganism. " The holidays of this world are inseparably linked to the worship of Nimrod — and Nimrod worship to Sunday observance. All have been inspired by Satan the Devil! All these doctrines are espoused and promulgated by the Roman Catholic Church and her Protestant daughters! Anyone who accepts and observes these pagan holidays is linked to Satan's Babylonian system, and has accepted its mark! 1. What does God say will befall those who follow the way of Babylon and worship according to this ancient pagan mystery system? Rev. 18:1-8. 2. Who is her Judge? Verse 8. Will she receive double punishment for her iniquities — the doctrines of lawlessness — she has committed? Verses 5-6. 3. What is God's command to His people who have not yet forsaken her pagan ways? Verse 4. 4. Will the apostles who fought her pernicious lies and the prophets who lamented her wicked sins, rejoice when this mother of paganism is destroyed? Verse 20. Will you be a partaker of God's plagues upon modern Babylon? (Rev. 18:4). Are you still partaking of her sins — compromising by keeping this world's holidays? Same verse. There is certainly no lack of factual material from ancient or modern history, from archeology, or from the Bible. All prove that the very same pagan rites worshipped by this world are those which have been perpetuated since the time of Nimrod. The churches of this world admit they have adopted pagan days shamelessly! — and God Almighty condemns them and their practices in His Holy Word. Does it make a difference? It certainly does! God has put the decision to you, just as He did in the days of Elijah. "How long halt ye between two opinions? If the Lord be God, follow Him: but if Baal, then follow him" (I Kings 18:21). The answer is up to you!